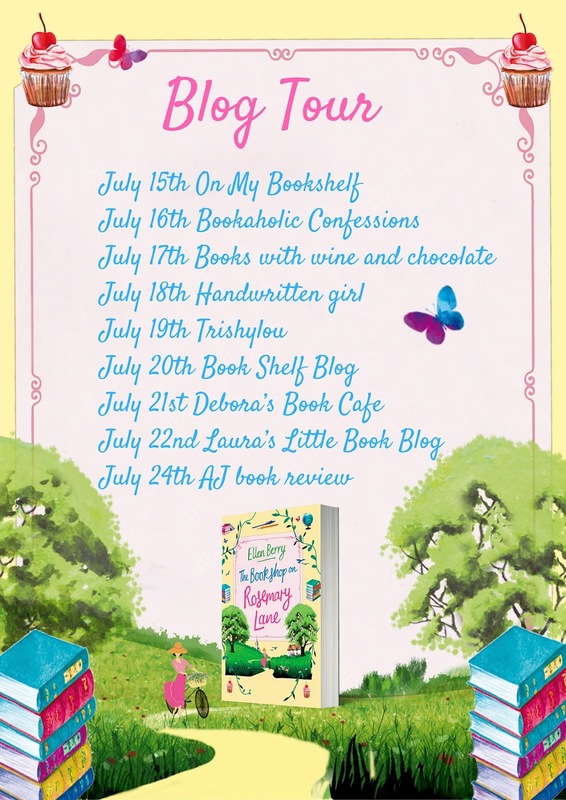 Welcome to my Stop on the Blog Tour for the gorgeous Bookshop on Rosemary Lane by Ellen Berry! I'm thrilled to be able to bring you an exclusive extract from this book! If this doesn't pique your interest, I don't know what will! This is a delicious story and the cover is divine! Without further adieu, read this and go buy the book!! ‘I meant,’ Roxanne said, as Della and Mark returned to the living room, ‘what are we going to do about Rosemary Cottage?’ Silence settled around the room. The twins, mercifully with headphones plugged in now, munched absent-mindedly on the remaining biscuits. ‘But it’s only September,’ Sophie countered. ‘I think you’re right, darling,’ Mark said. Although Della nodded in agreement, it wasn’t quite that. It was this: the gathering of the Cartwright clan, the way Jeff assumed authority as if he were still twelve years old and issuing library fines, and his wife’s snidey remark about Irene’s hair when she had been nothing but kind to their mother, making actual pastry leaves for the lid of that chicken and leek pie, for goodness’ sake. It was as if all that kindness counted for nothing. And what about Len from Burley Bridge Garage who’d fixed Della’s car for virtually no money? It made Della cringe, the way her brother and sister swept in and out of the village as if staying a moment longer would somehow taint them with its ugly, countryish ways. She couldn’t bear the thought of endless meetings and wranglings as the Rosemary Cottage business rumbled on. ‘You think we should put it on the market?’ Roxanne ventured. ‘Yes, I do,’ Della replied firmly. ‘We’ll have to clear it out, of course,’ Jeff added, glancing at Tamsin. ‘There’s nothing we need, is there?’ Good lord, he was mentally divvying up their mother’s possessions already. Della bit fiercely into a Rich Tea. ‘No, no.’ Tamsin shuddered visibly. ‘I don’t need anything,’ she said, unsurprisingly: her tiny two-bedroomed Islington flat was a shrine to minimalism. ‘Well, I can’t imagine anyone would want all that hefty old furniture,’ Jeff added, raking back his dark hair. ‘Er, I don’t think—’ Roxanne started. ‘And the opal ring,’ Tamsin went on, flushing excitedly now. ‘That is, unless it’s particularly special to anyone.’ At some point she must have compiled an inventory of Kitty’s jewellery, Della realised. ‘Actually, I don’t want any of it,’ she murmured. Thanks to Ellen Berry (aka Fiona Gibson) for joining me today and to Louis Patel at Avon Books for allowing me to be a part of this tour! Blog Tour Stop Valley of the Dolls 50th Birthday!